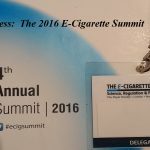 Impressions of the 2016 E-Cigarette Summit. We asked ten people who attended the 2016 E-Cigarette Summit for their thoughts on the day. Thank you to Sarah Jakes, Ian Gray, Catherine Kimber, Richard Hyslop, Louise Ross, James Dunworth, Andy Morrison, Paul Barnes, Ian Green and Gillian Eva Golden for taking the time to write such thought provoking and interesting accounts.